Rory McIlroy insists he will not lose any sleep over his major championship drought, even if it continues for the rest of his career. McIlroy won four major titles by the age of 25 and needs victory in the Masters to become only the sixth player in history to complete a career grand slam, but has not tasted victory in one of the game's biggest events since 2014. The former world number one began the final round of this year's Masters three shots off the lead and closed to within a shot of eventual winner Patrick Reed after two holes, but faded badly with a closing 74 at Augusta National. And after missing the cut in the US Open with rounds of 80 and 70 at Shinnecock Hills, the 29-year-old has just two chances remaining this season to avoid extending his winless drought in the majors to four years. "If I didn't win another major for the rest of my career nothing is going to change in my life," McIlroy said ahead of the Dubai Duty Free Irish Open at Ballyliffin. "Obviously I don't feel like I'll have fulfilled my potential. But at the same time there's other things in my life that are more important than golf. I'd be disappointed [to not win another major], but again it's not going to change things. I don't panic. It doesn't keep me up at night. "I just need to give myself chances. I was proud of myself just to get into the final group at the Masters this year. I didn't have a good Sunday. But I would have needed something pretty special to beat Patrick, anyway. "I've got two more chances this year to hopefully play myself into contention. That was my goal. My goal this year it wasn't to win majors. It was just to give myself a chance and to put myself in positions to see how I fair. "I did that at Augusta. I felt like I learned a bit from it and then hopefully going into Carnoustie [the Open] and Bellerive [US PGA] I can put myself in similar positions." McIlroy admits getting married last year has influenced his way of thinking, but added: "I think as you get older and as you evolve as a person you change and your perspective on things changes a little bit. It's not just the golf nowadays. There's a lot more that goes into it. "It's still my career and I still want to make the most of it and I still feel like I have a lot of time left to make my mark on golf, but at the same time it doesn't keep me up at night thinking if I never win another major I can't live with myself." 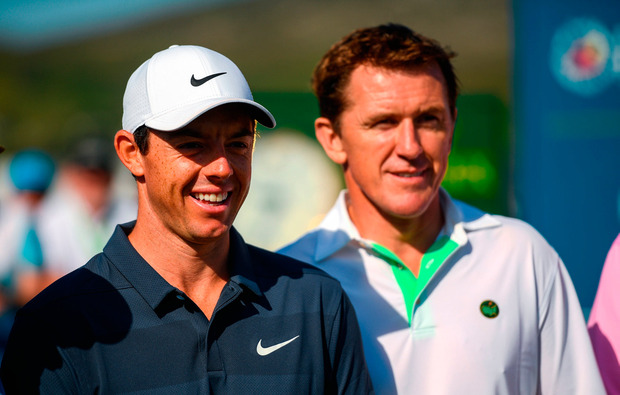 McIlroy won the Irish Open at the K Club in 2016 but has also missed the cut in four of his last five appearances, during which time he has had to juggle his duties as tournament host of the £5.3million event. "I've cut back from a few things off the golf course," McIlroy added. "There's been a couple of times where I just haven't felt as prepared as I could have been walking on to the first tee on Thursday. So I got here Monday morning, practised Monday afternoon and all day yesterday. "I've done my work so there's no excuse about not being prepared. I felt I was underprepared at County Down [in 2015]. I felt OK at The K Club I guess. I've learnt as I went along and I feel this year I'm right where I need to be."